That is one HONKIN' slab of meat. Usually, Snack Girl purchases food for review and then gives you the skinny - but I could not waste $3.50 on this clearly unhealthy offering from Subway. How do I know it is unhealthy? Well, just look at it! Does that look like 8 ounces or more of meat? So the Big Mac has 30 less calories and less sodium than the Subway BBQ pulled pork sandwich. Subway is the world's biggest sandwich chain - even bigger than McDonald's - and their motto is "Eat Fresh". Are Michael Phelps and Jared Fogle eating THIS sandwich? 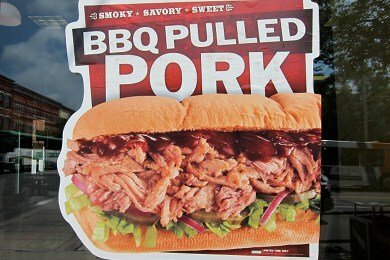 My problem with Subway isn't that they are serving a BBQ Pork Sandwich. The fact is that they are going to serve whatever we want to buy. But, many people believe that Subway is the healthier choice because it's marketing juggernaut has convinced us of it. You have to be VERY careful when you order at a Subway restaurant. I reviewed the problems with the Subway Veggie Delight here: SUBWAY Veggie Delight: FAST But Fresh and Healthy?. The last time I watched The Biggest Loser, the contestants visited a Subway. They did specific things like hollow out the bread and order low calorie dressing on their sandwich. If you make these kind of alterations to your sandwich, you will get a lower calorie option and if you load it with veggies - this can be a healthy choice. Use your common sense! Keep in mind that a Subway Buffalo Chicken with cheese isn't that different from a McDonald's Quarter Pounder with cheese. Do you go to Subway? What do you order? Michael Phelps would eat that. He ate 10000 calories a day. In all seriousness, I'd eat this, but probably only on a cheat day, actually I'd go to a real BBQ place and get the real thing. I get either the ham or the chicken breast no cheese or mayo. ~600 calories for a footlong. Granted the sodium is a bit high, but that doesn't really bother me. I like that they have charts on the glass to help you make better choices. 6 inch Veggie on 9 grain wheat with vinager and cheese... 6 points! yum!!! Yes! I love restaurants that openly display nutrition! I get the Cheesesteak Salad. It's 6 PointsPlus (with cheese!) and delicious. I don't use dressing because it doesn't need it. I would never eat there. Their bread contains HFCS and is nasty for you. Thanks. No pulled beef for me anymore. I like Subway! You just have to be smart about it. I usually order a salad with tuna salad on it. No salad dressing and all the veggies. It's usually big enough for me to have two meals out of it. The only thing I eat there is a veggie on 9 grain. I stay away from any of the veggies with preservatives/artificial colors like the pickles, banana peppers, etc. I order extra spinach and skip the worthless iceberg lettuce shreds they have. Lightly dress it with salt, pepper, little oil, little vinegar. They used to be somewhat healthy but when Quiznos started to hit it big and eat their market share, they went to the darkside. They started adding bacon, and offering unhealthy sandwiches, lots of cookies, etc. People may go there because they feel like they are doing themselves a favor and it is 'healthy' but when I am there everyone else seems to be ordering extra cheese, chips, cookies, soda, etc. Not Subway's fault though, that is what sells. Also, thank you for not falling prey to the 'Mom blogger' crap that McDonald's is spewing because they are throwing in apple slices now with all kids meals. So ridiculous. Have you had their apple slices? They don't taste good. They have like some lemon juice preserve or something on them. Also, I think the slices they are including are their 'apple dippers'. Dipping those in that carmel sauce would probably be worse than just eating half more fries. I do not know why this is so hard for them. Starbucks manages to sell prepackaged grapes, apples, etc. in their stuff and it actually tastes good. How hard can it be? I make pulled pork at home in the crock pot for a quick & easy dinner sometimes (probably not the best nutritionally), but I've also tried it with chicken - almost as good & healthier. Throw some chicken breasts in the crock pot with BBQ sauce - easier than Subway! Seriously - someone would have to be purely stupid if they thought a pulled pork sandwich was going to be healthy regardless of who was selling it. At Subway I either get the veggie delite, chicken breast or turkey. No cheese on any. Loaded veggies. Common sense people - get over the "lets blame marketing" & get a brain. I think Subway is gross. If I'm going to cheat, I'd much rather have a Big Mac! I too make pulled pork at home in crockpot with root beer. It's one of my favorite recipes. When I was in weight-loss mode, I ate at Subway at good bit, especially in the early days. Then it was down to once a week. These days in maintenance mode, it's like, "Oh God, I cannot STOMACH the thought of Subway." I go now, maybe once every 2-3 weeks, and almost always the roast beef, just because it's usually lower in sodium than the turkey or the ham. And I load it with nearly every veg they offer (cukes instead of pickles though). And don't get me started on how few vegetable choices are out there. Makes Subway look like the Garden of Eden by comparison! I'm not a calorie girl, I won't count them and since I stopped I've lost weight. The problem is not inherently calories it's the type of calories. I'm most concerned with the amount of carbohydrates and sodium in the dish. If someone really wants pulled pork, I would suggest that they get some on a salad with a little bit of olive oil. It will cut calories - though not necessarily all the sodium because of the sauce used on pulled pork. In most cases I would suggest cutting the bread out all together. For people eating salads, I agree don't put regular dressings on, but dooooo put healthy oils on, olive, grapeseed, flax (if freshly prepared). There are so many good oils you need and the fats will keep you full! I am a fat eater and will eat as much healthy fat as I can now, now that I know it's a myth that fat itself is what makes you fat. It's really more about ingredients than calories. I never eat at Subway and I'm glad. I go to Goodcents quite often though, you should do a blog on that if you need an idea :) I'd be very interested to know your thoughts! I'm not sure why you'd bother going to Subway at all if you were just going to have to have them hollow out the bread... I mean... it is a sandwich shop.